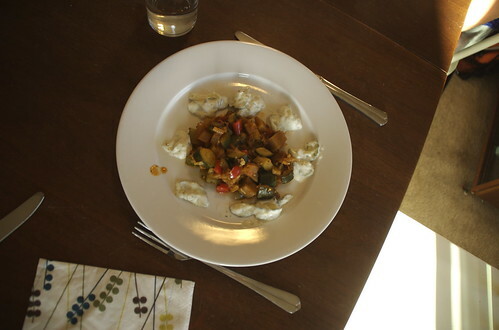 Bjørn made his eagerly awaited Ratatouille this evening (folks who are paying attention will note it came a day late). It was delicious! I would never have thought to accompany it with Tzatziki, but they went shockingly well together. We were extra lucky to have a couple impromptu vegetarian guests pop over for dinner so his meal was especially timely. I’ll admit I was extremely nervous about handing him the knives and vegetable peeler, even with (over-)careful instruction, and I did have to remind him (many, many times) that if he left his fingers in the way they would get chopped right along with his onions. Sauté one medium sized onion in butter with a bit of vegetable oil (most recipes call for olive oil, but I find it it a bit bitter, I like my Rat mellow). While that’s simmering, chop one green and one red bell pepper. Toss into the pot when the onions start to turn translucent. Stir gently. Peel and chop into cubes one medium sized eggplant. Toss it in. Stir gently. Chop five medium zucchinis. Toss ’em in. Stir gently. Add some marinara sauce or fresh tomatoes (I use a marinara that’s pretty rustic with large chunks of tomato). Crush several cloves of garlic (to taste). Mix and simmer on medium-low for half an hour. Serve with warmed up baguette to soak up all the juices. For desert we had Profiteroles (from Trader Joe’s) drizzled in warm chocolate sauce. YUM! your version seems so easy! When I’ve made it before it seemed to involve hours of chopping and hours of (ahem, untended) cooking. I thought I was the queen of easy cooking, but I’ll have to try this version. My husband refuses to eat the kind I like because of the “mushy eggplant.” And if your parents are French, then your version MUST be authentic! Thanks for all of the inspiration on your blog! I love your pictures. Lovely blog indeed ! Hi, just found your blog via White Country and I’m very glad i did! You have just provided some much needed inspiration in the craft department. Not to mention some great cooking ideas, my daughter, who’s 8, is in a big wanting to cook stage, so I’m definitely going to use the ratatouille recipe. Thanks!! That sounds like a great project to try with my kids. Love the photos that you take.